As Chief Brian Kyes stood at the podium in Boston’s Federal Court last Friday after an historic roundup, four years in the making, of key MS-13 gang members in Chelsea, Eastie, Everett and Somerville, he thought of one innocent single mother who had simply looked out the window of a battered women’s shelter when she heard fighting. For that short peak, she got a bullet in the head – premeditated and, as charges suggest, with extreme violence carried out by two MS-13 members from a clique in Somerville. Around 5 a.m. on Friday, Federal Bureau of Investigation (FBI) officials, Homeland Security, State Police and local police began arresting targeted members of the gang – that following an investigation that has been underway since 2012 and the recent indictment of 56 local members on RICO charges ranging from murder to drug trafficking. More than 400 law enforcement officials made some 37 arrests on Friday, 14 of those listed as being from Chelsea. Some 15 of those indicted were already in custody on federal, state or immigration charges, including one man from Chelsea. Authorities also announced the arrest of the gang’s East Coast leader, Jose Martinez-Castro, of Richmond, VA.
Perhaps most important in Chelsea was an accountability for a rampage of violence that the gang has inflicted mostly on Chelsea soil, though many times the players and conflicts come from cliques in Everett, Somerville and Eastie. Five murders were charged, including two in Chelsea and three in Eastie. Of those in Eastie, two of the victims were young teens from Chelsea – one a 15-year-old from Chelsea High School, Irvin De Paz. There were also 14 charges of attempted murder leveled against gang members, and a shocking 10 of those attempted murders occurred in Chelsea in 2014 and 2015. Drug Trafficking charges of five kilograms of cocaine were also leveled against the gang in Chelsea. “Our goal is to stop the violence and the danger and fear they enact upon these communities,” said U.S. Attorney Carmen Ortiz at a press conference on Friday. As a result of the investigation, five very troubling murders were tied back to MS-13. In Chelsea, the murder of Katerin Gomez in Oct. 2014 was tied to Somerville clique members Hector ‘Cuervo’ Ramires and Bryan ‘Chucky’ Galicia-Barillas. The indictment charges that the two men with extreme atrocity and cruelty murdered her as she looked out the window. Javier Ortiz was murdered on Dec. 14, 2014 by Chelsea clique members Hector ‘Vida Loca’ Enamorado, Luis ‘Brujo’ Solis-Vasquez of the Everett clique, Noe Salvador ‘Crazy’ Perez-Vasquez of the second Everett clique and Jose ‘Smiley’ Miguel Hernandez, also of the second Everett clique in Chelsea. The murder came as a result of an altercation with Ortiz the night before. Following the murder, the indictment indicates, Enamorado and Solis-Vasquez were congratulated for the murder at a meeting of the East Side Locos Salvatrucha (ESLS) in Everett. Two ESLS leading members, allegedly, were beaten by the gang members as discipline for not helping the two killers the night before. In Eastie, on Constitution Beach, Wilson Martinez was killed in Sept. 2015 with extreme atrocity by one member from the Everett clique and two members from another clique, as well as a juvenile. The indictment alleges they were encouraged beforehand by Perez-Vasquez to murder more rival gang members in order to get promoted. All of those that participated in the murder were promoted within their cliques – one getting a 13-second “beat in” by numerous clique leaders on Deer Island Dec. 6, 2015. In particular, the murder of De Paz, who was only 15, of Chelsea, was tied to the two violent strains of Everett MS-13 cliques. The Everett-based ESLS and the Everett-based ‘Everett Locos Salvatrucha (ELS) had encouraged Everett’s Joel ‘Animal’ Martinez to murder De Paz in order to be admitted to the gang. The leader of ELS, Noe Salvador Perez-Vasquez, gave the initial encouragement, it was alleged. The murder took place on Sept. 20, 2015 in Eastie. After the murder, the ELS clique disciplined Martinez by beating him at a meeting and refusing him entrance. However, after that, on January 8 of this year, the ESLS clique allegedly initiated Martinez in a meeting at an Everett auto body shop. After he was beaten for 13 seconds, he was welcomed into the group – according to the indictment, which was established using wiretaps. Finally, just a month ago, on Jan. 10, in Eastie, Christopher Perez-De La Cruz was allegedly murdered by members of two Somerville cliques. That murder, it was alleged, came due to a call from the East Coast leader in a December 2015 meeting in Richmond, VA for cliques in Massachusetts to be more active in killing rival gang members. March 28, 2014, Hector ‘Cuervo’ Martinez attempted to murder one victim with a knife. April 6, 2014, Rafael ’Tremendo’ Leoner-Aguirre attempted to murder two victims by attacking them with a machete. April 16, 2014, Aguirre, Josue ‘Gallito’ Morales, and Kevin ‘Blancito’ Ayala attempted to murder two men with a gun, hitting one of the victims. May 29, 2014, Daniel ‘Roca’ Menjivar and David ‘Cilindro’ Lopez attempted to murder one victim by stabbing him with a knife and shooting him with a gun. Sept. 8, 2014, Angel ‘Bravo’ Pineda and Jose ‘Little Crazy’ Vasquez and Bryan ‘Chucky’ Galicia-Barillas attempted to murder on victim by stabbing him with a knife. Around April 2015, Menjivar, Lopez, Galicia-Barillas and Aguirre and a man only known as ‘Violento’ attempted to murder one victim with a machete. That victim had been an MS-13 member, and a green light was given to kill him by a leader of the gang in Arizona – as he was suspected of working with law enforcement. May 12, 2015, Jose ‘Muerto’ Hernandez-Miguel and Luis ‘Brujo’ Solis Vasquez attempted to murder a man with a knife. May 26, 2015, Galicia-Barillas and Domingo ‘Chapin’ Tirol attempted to murder two men by stabbing them with a knife. Aug. 23, 2015, Edwin ‘Sangriento’ Gonzalez attempted to murder two men by attacking and striking them with a machete. Dec. 27, 2015, Joel ‘Animal’ Martinez and Mauricio ‘Tigre’ Sanchez attempted to murder one victim by stabbing him with a knife. Most shockingly, federal officials detailed the fact that the gang was allegedly recruiting members from inside local high schools and middle schools – including Everett High School, Chelsea High School and East Boston High School. In order to recruit, the gang was involved in the three local high schools – both during school and after school – to get students to join the gang. Younger prospective gang members were often encouraged to commit more violent crimes to move up in rank. Supt. Mary Bourque sent a letter home to parents and students following the raids on Monday. Chief Kyes and City Manager Tom Ambrosino said they will be vigilant to make sure gangs don’t return to the schools or the school kids looking for recruits. “Schools are supposed to be a safe place for learning and gangs have no place in schools,” he said, noting the coordination that the Chelsea Police has with CHS when it appears a student is headed down the wrong path or may need help. Additionally, Homeland Security officials announced that they were holding 10 individuals who weren’t facing charges, but had significant ties to the gang and were not in the country legally. According to court documents, in 2012, MS-13 became the first, and remains the only, street gang to be designated by the United States government as a “transnational criminal organization.” MS-13 is one of the largest criminal organizations in the United States, and is an international criminal organization with over 6,000 members in the United States, with a presence in at least 46 states and the District of Columbia, as well as over 30,000 members internationally, mostly in El Salvador, Mexico, Honduras, and Guatemala. In Massachusetts, MS-13 is largely composed of immigrants and descendants of immigrants from El Salvador and has members operating throughout the Commonwealth, with higher concentrations in Chelsea, East Boston, Everett, Lynn, Revere, and Somerville. During the course of this investigation, she said, this violence was directed against rival gangs, particularly the 18th Street gang, and anyone who was perceived to have disrespected MS-13. The 18th Street gang, another criminal organization in Central America with members living in the United States, has been a longstanding rival of MS-13. MS-13 members and associates often commit murders and attempted murders using machetes, knives, and chains in order to intimidate rival gang members – weapons that were confiscated and in full display on a table in front of Ortiz during the press conference. The indictment further alleges that members of the MS-13 organization in Massachusetts sell cocaine, heroin, and marijuana, and commit robberies, in order to generate income to pay monthly dues to the incarcerated leadership of MS-13 in El Salvador. This money is allegedly used to pay for weapons, cell phones, shoes, food, and other supplies for MS-13 members in and out of jail in El Salvador. It was alleged that the money is typically sent from wire transfer stores right in the communities. U.S. Attorney Carmen Ortiz details the charges and atrocities unveiled by MS-13 in East Boston, Everett, Chelsea, Somerville and elsewhere during a press conference to announce the surprise round up of some 37 gang members on Friday morning by 400 law enforcement officials. A host of charges were levied against 56 members who were indicted on charges ranging from murder to drug trafficking to attempted murder. The Record performed an investigative report in 2013 about the amounts of wire transfers in 2012 from stores in Chelsea, East Boston, Everett and Revere. The paper found that $247 million left those communities in one year, with $72 million of that money going to El Salvador. Fewer things are more frustrating for Chelsea drivers than seeing the gates go down on the Chelsea Street Bridge. Were it a few minutes of idle time, folks might tolerate it. However, one could have a five-course picnic on the side of the road, clean up the mess, and get back in the car within the time it takes the $185 million vertical lift bridge to go all the way up, allow marine vessels to pass under and then come back down. Consequently, rather than waiting, most drivers make quick U-turns and head to alternative routes. Those that wait it out, are most certainly late to work or to airline flights – and to add to the misery – many times the bridge goes up at the most inopportune times, such as morning and evening rush hours. From Chelsea to Eastie to MassPort and even far-flung territories like West Revere, people are speaking out against the inconvenience of the relatively new state-owned bridge that serves only to accommodate vessels going to three large oil companies – Gulf, Irving and Global. This week, City Manager Tom Ambrosino said he plans to to convene a meeting of stakeholders on the inconvenience of the bridge. Ambrosino said the movement on the frustrating issue came when MassPort indicated the airlines at Logan were growing very angry about how the bridge was delaying the arrival of employees. Most airline workers park at the MassPort Garage in Chelsea and then take buses to Logan that utilize the Chelsea Street Bridge. When the bridge is up, the employees are not able to get to work on time in large numbers. But they’re not the only ones complaining. Roseanne Bongiovanni of the Chelsea Collaborative said she has heard of some people taking the bus to Revere to avoid the bridge. Eastie Sen. Anthony Petruccelli said earlier this summer that he is pursuing the idea of putting some restrictions on the times when the bridge can go up. He said he would hope that such restrictions could at least cover morning and evening rush hours. Petruccelli said he and his office have researched bridge operations elsewhere that do have opening restrictions placed on them and these restrictions are imposed by the U.S. Coast Guard. The issue was first brought to MassDOT’s attention by Boston City Councilor Sal LaMattina back in February. 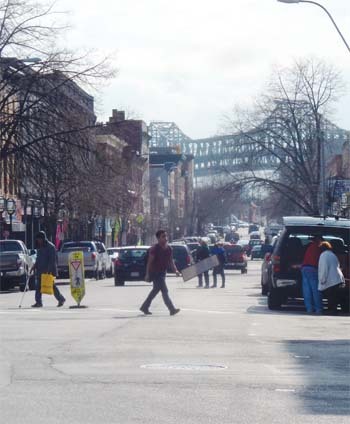 In a letter to MassDOT Acting Secretary Frank DePaola, LaMattina expressed his concerns about significant traffic delays that the residents and business owners have been experiencing with the new Chelsea Street Bridge. While LaMattina said he understands that the installation of a new, complex structure such as the Chelsea Street bridge requires a suitable break-in period to implement new procedures and equipment, he believes that an adequate break-in period has passed for the new bridge and that MassDOT should take whatever steps are necessary to reduce the current unacceptable level of delays from the new Chelsea Street Bridge as soon as feasible. John Vitagliano, who was a community relations outreach specialist for the bridge during its construction, said he has noted tremendous concerns and will be working with Ambrosino on the solutions. Three key problems, Vitagliano said, are that the bridge has a much more complex operating system that takes longer to cycle through, the bridge is much wider and it takes longer to get people off of the span, and there are more restrictive safety requirements put in place before the bridge can be raised. Those safety requirements come as a result of the tragic killing of a woman on the McArdle Bridge last year as it raised while she was still walking on it. Just a few weeks after the Boston Herald endorsed the Mohegan Sun project, the Boston Globe surprised everyone with a comprehensive endorsement of the Wynn casino project in its edition on Sunday, Sept. 9. The Globe’s endorsement – which covered an entire page of the paper – went on to say the Mohegan casino should have been done with after last November’s failed referendum in Eastie. 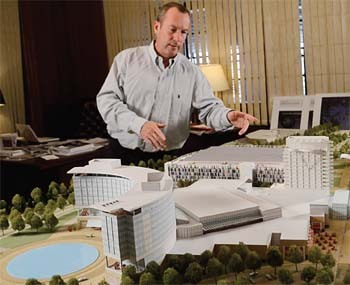 “The defeat of the initial casino plan at the site last year should have been the end of the proposal, and the hastily revised plan and Suffolk Downs’s new partnership with Mohegan Sun does not cancel out the clear verdict of voters in East Boston last year on a materially similar proposal,” it read. The Globe’s seal of approval prompted a lengthy letter from Revere Mayor Dan Rizzo on Monday about what he considered inaccuracies with the editorial. Wynn had no comment on the Globe endorsement when contacted, or to the Herald’s endorsement of its rival project. Senator Anthony Petruccelli, with help from Chelsea Senator Sal DiDomenico and Senator Patricia Jehlen, added language last week during a late night session to amend the state’s Chapter 91 law. The amendment’s language would block Global Oil’s proposal to bring 1.8 million gallons of ethanol by train twice a week through parts of Chelsea and store the fuel at their facility on the East Boston/Revere border. The amendment was passed and is now in Conference Committee where it will be debated. The language inserted into the Chapter 91 law states that “an ethanol storage or blending facility that stores or blends or is intended to store or blend more than an average of 5,000 gallons of ethanol per day and is located within one mile of a census block that has a population density of greater than 4,000 people per square mile shall not be granted a license under this chapter. For the purposes of this section, ethanol shall be defined as any mixture composed of not less than 30 percent ethanol”. Petruccelli called the passage of the amendment a ‘huge win’ for environmental activists in Chelsea, Revere and Eastie that have worked to block ethanol trains from coming to the area. 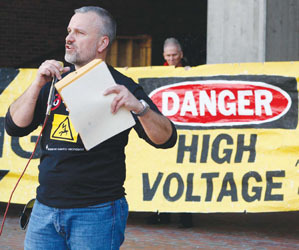 Residents in Chelsea, Eastie, and Revere have long expressed concerns over Global’s proposal to bring 60-car trains carrying 1.8 million gallons of ethanol, a highly flammable material, two times or more per week along commuter rail tracks to its terminal on the East Boston/Revere line. Global’s plans were slowed last year at the state level by legislation co-sponsored by Petruccelli and DiDomenico. Petruccelli and DiDomenico, became the first elected officials to file any significant legislation to slow Global’s plan to begin shipping ethanol on from upstate New York via train through densely populated areas in Chelsea Everett and Revere. Petruccelli and DiDomenico added an amendment to a state transportation bond bill that prohibited the state’s Department of Environmental Protection (DEP) from issuing Global a Chapter 91 license to build the ethanol storage facility on the Eastie/Revere line until a comprehensive safety study is completed. MassDOT’s Ned Cod briefed residents on the study, which was completed in the winter. However, there were many unanswered questions in the study—questions residents at several community meetings felt should be answered. With the study completed, activists seemed to have run out of options to block Global’s Chapter 91 license from being granted-until last week’s amendment was passed. corridor accounted for the transfer of $42.6 million in 2012. In four of the poorest communities in Massachusetts (Eastie, Revere, Chelsea and Everett), money transfer stores in 2012 helped residents send $247.08 million in cash to several foreign countries around the world. The process of sending money from the U.S. to foreign countries is nothing new, and there is certainly nothing illegal or wrong about it, but the vast amounts of money leaving the local economy leaves serious questions about the impact of such widespread practices on local businesses during tough economic times – not to mention that the large sums are being sent from areas that statistics show are terribly impoverished. Others, however, argue that the practice – known as remittances – helps family members who are left behind in Third World countries and who struggle to survive. Many of those are children, family and friends, and it is argued that they would not make it without remittances. International Policy organizations – such as the World Bank – hail remittances as the quickest way to transform the economic stability of developing countries and prevent suffering. The Independent News Group (ING) analyzed state statistics on money transfers for the year 2012 and for the areas of East Boston, Revere, Chelsea and Everett. The statistics are gathered annually by the state Division of Banks and are simply activity reports that list each store’s address, the total dollar amount sent during the year, the numbers of transactions and the destination country. In that four-community area, the paper found that $247.08 million in cash was sent to numerous countries – with El Salvador ($71.6 million), Brazil ($47.6 million) and Colombia ($45.45 million) being the top recipients. Statewide, the ING estimates that more than $2 billion per year is being sucked out of local communities. A Boston Globe story in 2010 reported residents statewide sent $1.8 million overseas in 2009. The top Money Transfer stores locally were on Bennington Street in Eastie, Superley (21 Bennington St.) and Teleonda (202 Bennington St.), both owned by Humberto Grajales. Combined, the two stores sent $25.62 million overseas, primarily to El Salvador and Colombia. Though the paper did visit both stores and leave messages for Grajales, he had not contacted a reporter by press time. In fact, the paper visited seven of the leading transfer stores locally, and found no one who would return a message or comment on their local transfer business. As context to the overall situation, all four cities have some of the highest rates of poverty and highest numbers of people on public assistance. In Chelsea, the public school statistics this year indicate that 88.9 percent of students in the schools are classified as low income. In Revere, some 76 percent of students are classified as low income. Recent statistics from the state Department of Transitional Assistance (DTA) show that 23,961 people in the four communities are on some sort of public assistance, with the numbers being Chelsea (6,995), Revere (6,353), Eastie (5,636) and Everett (4,977). Money Transfer stores dot the landscape of virtually every city in the area, usually occupying storefronts, offering accompanying services and – typically – smelling of flowery incense. Some like Chelsea’s Spectrum Communications are simple corridors with gumball machines and a transfer agent sitting behind a secure fiberglass window. Others like Eastie’s Aries Communications are more elaborate with flat-screen televisions, a jewelry store, a cell phone dealer and comfortable waiting areas. In Revere, there are large volume check cashing businesses that offer one-stop shopping – where you can cash a check, send a remittance and pay an electric bill. Still others, like Everett’s Petionville Bakery & Restaurant are mostly places to eat, but with a transfer station sitting separately off to the side. Posters trumpeting ‘Envios Dinero (Send Money)’ dot the walls of most stores informing customers of the various service fees to each country. Currently, there are no fees or taxes imposed by Massachusetts or the U.S. government, but transfer businesses typically will charge a flat rate per transaction – such as $8 per $1,000 sent to El Salvador. While most Money Transfer stores are locally owned, the actual money wiring services are operated by a handful of large companies like Western Union, Continental Exchange Solutions, MoneyGram, and New Age Financial Services. While immigrants over the centuries have always sent cash home, the new systems operated by these companies have been modernized to the point that it has become extremely easy, very reliable, and incredibly fast to send cash. In most cases, money brought to a local store in the morning can be hand delivered later that afternoon to the front door of a family member in a foreign country. Fatou Fatty, director of Women Encouraging Empowerment, an immigrant education and civics organization in Revere, said the topic of remittances doesn’t come up often in her classes. It’s something she said makes people nervous. However, others have a different view, such as Lucy Pineda – a Revere resident who runs the Latinos United in Massachusetts (LUMA) office in Everett. Pineda – who has been in the United States for 26 years – said the vast amounts of remittances being sent from the U.S. has changed her native country of El Salvador for the worse. Conversely, in America, she observed that many immigrants severely deprive themselves to send all of this money back home. International organizations, such as the World Bank, praise the kinds of remittances sent from the four communities here, as well as those sent from all parts of the developed world to individuals in the Third World. The newspaper contacted the Embassies of Colombia and El Salvador for a discussion on how important remittances are to their countries and peoples. New El Salvadoran Ambassador Ruben Zamora said it is something that is crucial to the country. While some see remittances as positive, others ask at what cost to the local communities – the local businesses on every community’s Main Street. Naturally, with large immigrant populations sending so much disposable income out of the community, remittances are seen as money that isn’t being spent at local stores, restaurants and markets. Pineda interjected that immigration reform could help stem the tide of some of the remittances, as undocumented workers tend to send everything home because they cannot open bank accounts. Several local Chambers of Commerce were asked to comment on the situation as well, noting that their memberships were perhaps losing out on millions of dollars in business each year due to the volume of remittances here. Such is the often-unspoken negative side of large, new immigrant populations. While those workers earn millions from the local economy, they often don’t spend that money in the same local community – but rather ship the lion’s share of it out of the country. Chambers in Everett and Eastie took the matter under consideration, and are deliberating a position. Revere Chamber of Commerce President Bob Upton said his organization had no official position, but his personal opinion is he hopes more of that money could stay in Revere. Last Thursday, just off of Broadway in Chelsea, a steady stream of residents filed into the Spectrum Communications store and the Latino Express store – two Money Transfer locations on opposite sides of Everett Avenue. Speaking in Spanish mostly at Spectrum, one person after another handed over hundreds of dollars in cash to a woman stationed behind a fiberglass window in a store that was nothing more than an empty corridor. By the end of the day Thursday, that money probably arrived at someone’s doorstep in any number of points around the world. Just around the corner, though, one can find a promising restaurant that failed quickly, and up Broadway several blocks one can also find the empty shell of an award-winning small BBQ restaurant – a restaurant that left Chelsea for South Boston and has found success there.